Even though I often pick up the odd, small building set, I don’t usually feel compelled to review them since there are a lot of websites out there that do a fine job of keeping tabs on the newer sets as they are released. However, when I saw new Call of Duty line made by Mega Bloks, one thing caught my eye immediately, and that is the newly designed minifigures. So, to dip my toe in the line, I selected one of the smaller sets available, the Drone Attack #06813 set. This set contains 95 building pieces and consists in one drone weapons platform and one minifigure with accessories. 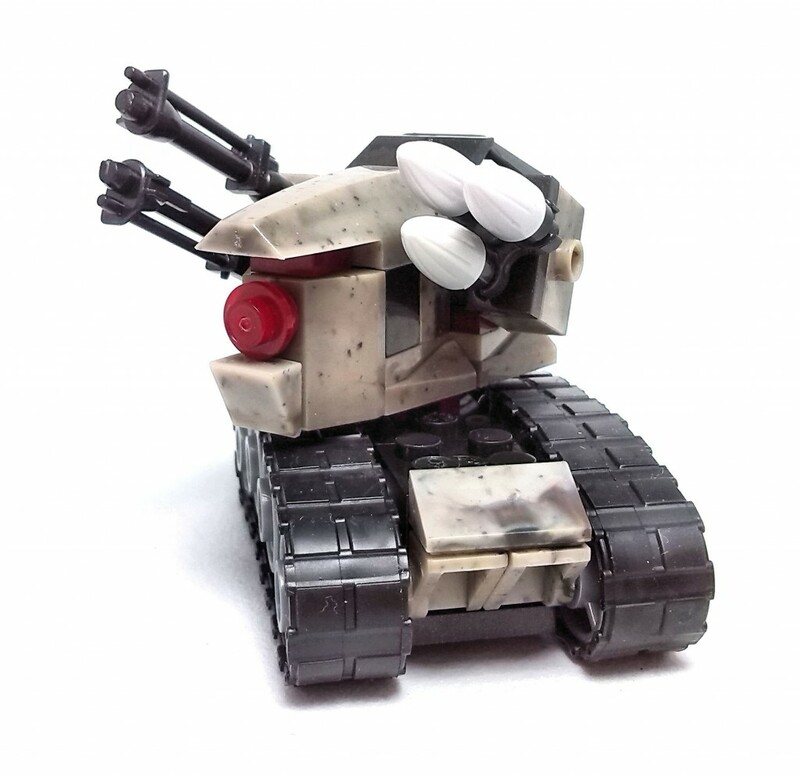 The Drone is a quick, satisfying build that uses the new tan camo bricks that have swirls of a darker color embedded in them. There are also a few construction elements molded in other colors, but these are either a solid color of translucent red, which adds to the visual impact of the piece. The drone features a pair of small flexible rubber threads that works fairly well over rough surfaces. Not having played the more recent Call of Duty game that features this drone, I could not gauge the accuracy of the finished model but nevertheless, it makes for a fun, little vehicle. 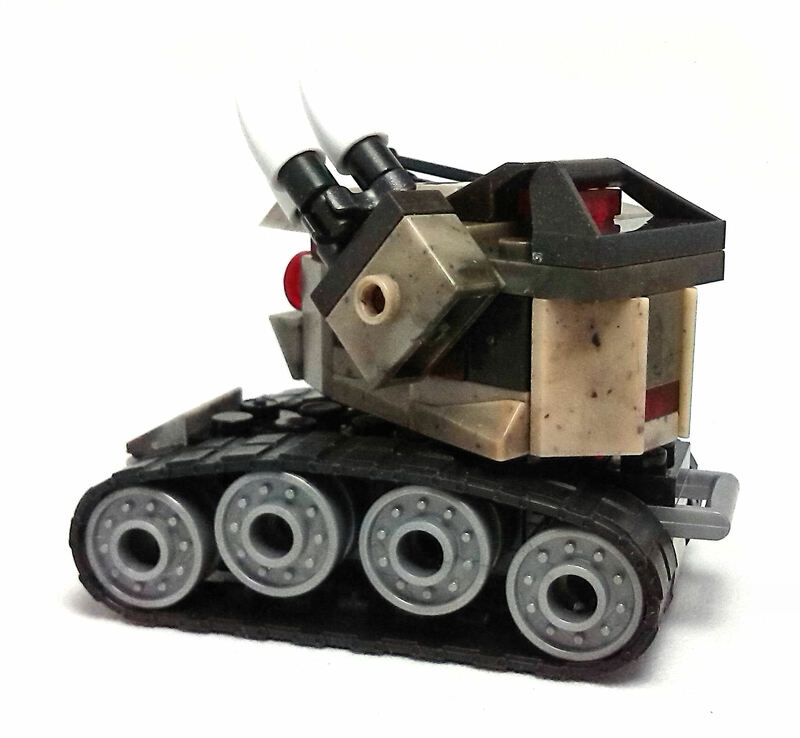 The Drone comes outfitted with a machine gun on his right side and a trio of missiles on his left side, all mounted on swiveling arrays attached to the rotating turret/head. The new Call of Duty minifigures represent one step closer for Megabloks towards the production of full-fledged action figures. 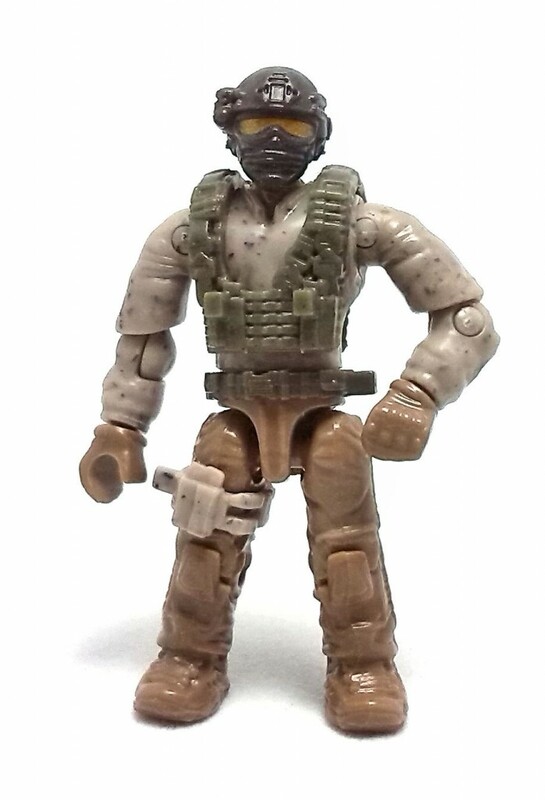 The figure included in this set is of a regular army guy dressed in desert fatigues. 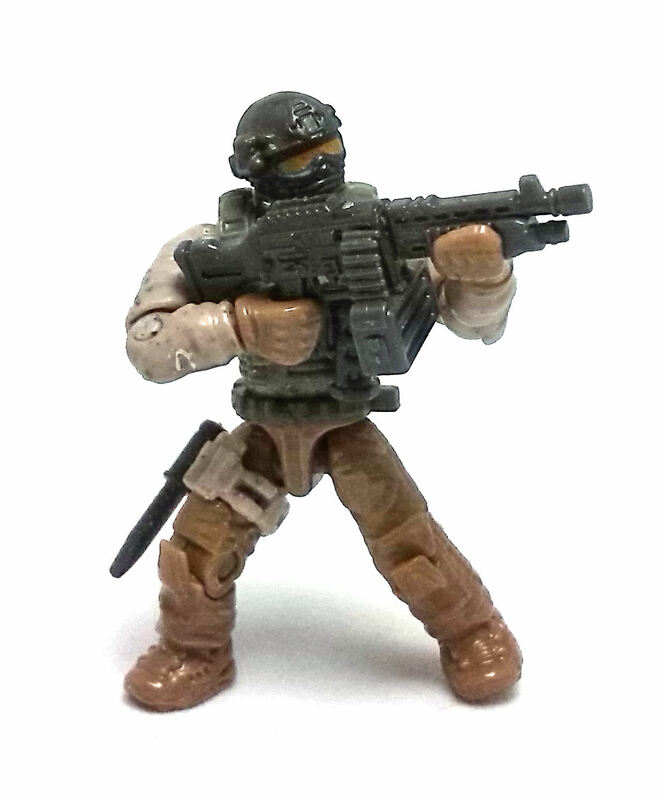 The level of sculpted detail on the figure is unusually high for minifigs and the overall body proportions are closer to normal humans than the more stylized LEGO minifigs or even Mega Bloks own Halo figures. 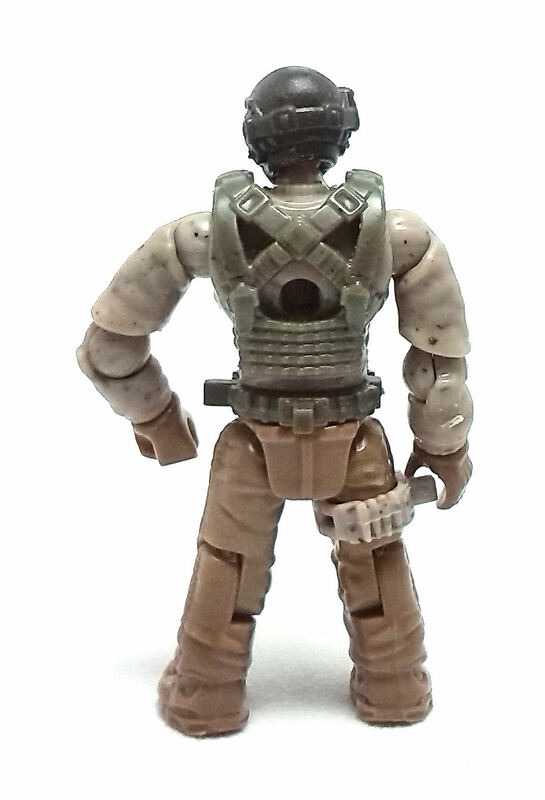 The figure came completely disassembled in a separate plastic bag, along with a couple of accessories to further personalize it, like a leg strap and web-gear for the torso. These pieces have rectangular hard points that allow attaching more of the included accessories. 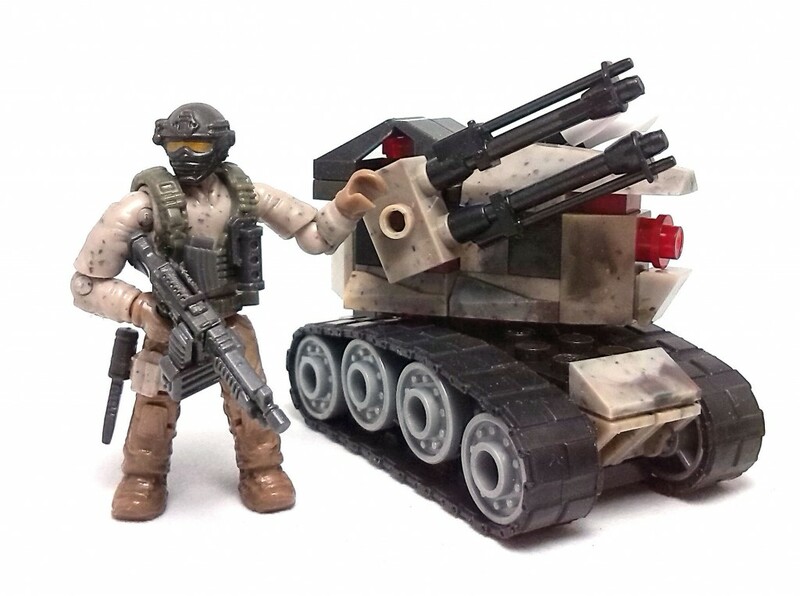 The weaponry included for this figure is an assault rifle, a grenade and a knife. There are also included a small ammo magazine as well as a high capacity ammo attachment. The assault rifle is composed of three separate pieces, which further adds to the customizability of these weapons. Being a construction set, there is not a lot of painted deco going on except for the visor on the guy’s head. The overall color scheme of the pieces works quite nicely on is own and it is certainly a good thing that this set didn’t require the application of labels. 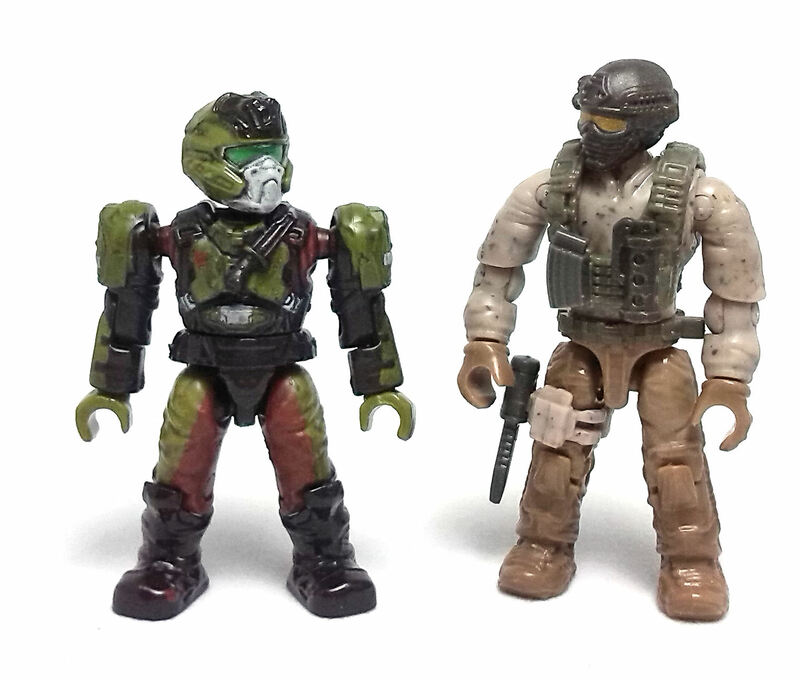 Overall, the Drone Attack set turned out to be a nice introductory set to the series.